Most current season updates here. 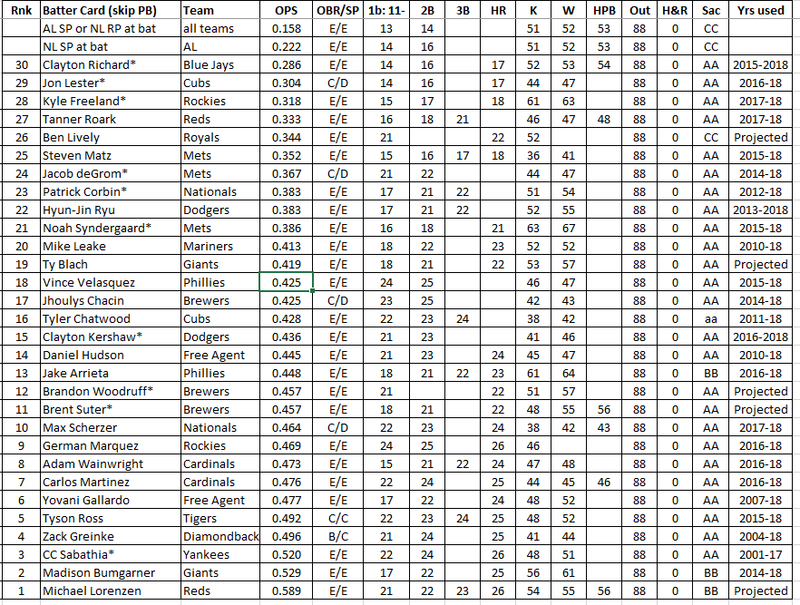 following list counts down the best 30 hitting pitchers in Major League baseball and shows their Statis-Pro batting cards that are now included in this google sheet of all players for use in the free Statis-Pro game. With Ohtani's (0.879 projected OPS among the best of all batters) only able to DH in 2019, the ultimate battle of silver bat contenders featured Bumgarner beating Wainwright in the season results here. The first two lines show the results of plays if an AL starting pitcher or NL relief pitcher must bat, with the result of the card only resulting in about a 0.158 OPS. NL Starting Pitchers hit a bit better at a 0.222 OPS clip, which results in singles 11-14, doubles on 15-16, then strikeouts on 17-51, a Walk if the result is a 52, hit by pitch if 53, and an Out if 54-88. Pitchers use the CC bunting chart (AA is best and DD is worse). The countdown from their through the 30th best hitting pitcher down to the best based on expected OPS that would result from their card over time. When a pitcher comes to bat, the "PB" rating of the pitcher is ignored and the RN on the next card is always used on the numbers below for the result. The reason you can't use PBs when pitchers hit is that this would make a PB2-9 worse than a PB2-5 when facing an opposing pitcher because you would want the action on the weak hitting g pitcher's card. The main problem with using season stats to produce hitting cards for pitchers is always that the sample size is too small. Therefore, I used the following processes to determine the hitters card for each pitcher. The standard cards used by all pitchers except the 30 are based on a compilation of all pitchers hitting. If a pitcher had 125 career plate appearances and his OPS was consistently better than the standard card - either over .300 or over .200 but with the ability to hit triples or home runs - then a card was produced. If a batter had many more at bats than 125, then I used the option of only using more recent seasons (e.g. Clayton Kershaw did not hit well his first few years but has since then so I used the last three years). In either case, the years that were used are shown in the column on the right. However, in some cases a pitchers has hit extremely well but not been to the plate 125 times yet. In those cases, we assume he would not keep at the same pace. In those case I assumed that over the course of additional at bats to get to 125 that he would get just 3 singles and strike out 8 times every 20 times at bat. Even holding down the Reds' Michael Lorenzen's averages by adding on those at bats, he edged out the Giants Madison Bumgarner for the best hitting card - but both calculate to hit home runs on 3 of their 64 possible results - which is like another batter having 6 home run numbers since they only have the action on their card half of the time after the PB flip to see if the opposing pitcher retains control. Since Lorenzen does not look like he will be in the Reds new improved rotation and CC Sabathia's hitting talent is being wasted in the AL, we decided to make our first game in the ongoing NL season a match-up of Bumgarner's Giants and Wainwright's Cardinals. 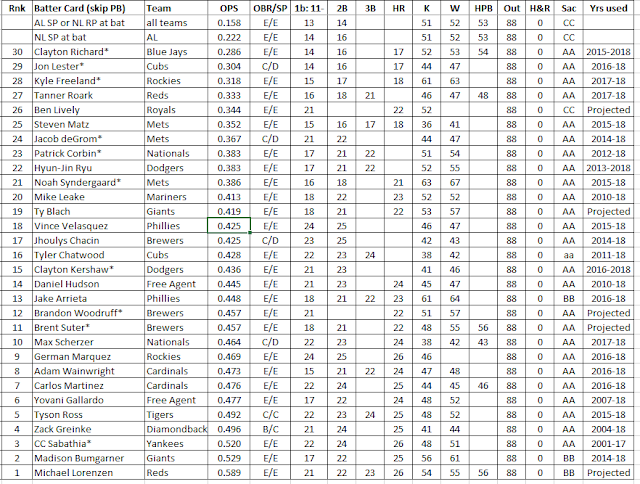 While update the player sheet for these 30 top hitting pitchers, I also updated the "Sac" rating for all batters.